It is a common fact that mold thrives in damp conditions, which is why your grout lines create the ideal environment for mold to live in. Most homeowners become aware of the presence of mold when it is too late, and look for ways on how to get mold out of grout lines. However, in these cases, prevention is better than cure. Here is everything that you need to know on how to get mold out of grout lines and also how you can prevent mold from occurring. 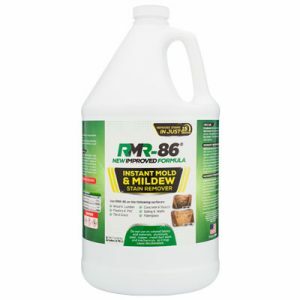 Besides the homemade remedies and tricks, here you can read reviews of the best mold removing products you can buy on Amazon such as the RMR-86 Instant Mold Remover. 1 Why should you remove mold from grout? 12 How to actually do it? Why should you remove mold from grout? Molding is a condition that can occur anywhere, at any individual’s homes. Mold basically requires moisture, oxygen, food and a surface to grow on, which is why mold has been in existence for centuries now. However, the growth of mold can be quite detrimental and even harmful, not just for your home but also for the health of those in your home. Mold gives off a particular odor and color, so if you do find mold at your home, it is important that you work on ways to remove this mold as early as possible. Any areas in your home which have poor air circulation, are damp, and even warm is the ideal environment for mold to start growing and thriving. This is why bathrooms, basements, laundry rooms, and kitchens make such an ideal place for mold to grow. You can find mold growing on the ceilings, on wood furnishings, in the caulking, on carpets, between tiles, grout lines and on the walls in the areas where there are high humidity and poor circulation of air. However, mold growing on tile grout is something that most homeowners might find in their home. The main reason behind this is that tiling is usually laid down in places where there is a lot of water or moisture, such as the bathrooms or the kitchens. These areas are prone to seeing an abundance of water; such as in the showers, water in the kitchen for cooking or cleaning, etc. Grout by itself is also quite porous in nature, and this, along with the presence of moisture, makes it an ideal environment for mold to start growing in. Many people often prefer to use DIY products as opposed to strong, harsh chemicals to remove the mold from their grout. Chlorine bleach is one of the most common items to use for removing mold from grout lines at your home. The chlorine bleach is an effective solution not only for killing mold spores and eliminating them from in between the grout lines, but the bleach also helps to clean as well as disinfect the tiles and grout. Take a spray bottle and add one part chlorine bleach with four parts of water. The spray bottle will make it easier for you to target hard to reach places on the tiles. Using the spray bottle, spray on all the affected areas and leave the solution on for about 30 minutes. Using an old toothbrush, brush these affected areas vigorously to remove the mold spores and any stains on the tiles and in between the grout lines. Rinse the area with cold water, and you will see a visible difference. If required, you can repeat the process in the same area once again to clean it further. You can find more information about removing mold with bleach in this article. Using chlorine bleach can be an effective solution for removing mold from grout lines, however, the bleach itself can be potentially harmful to the individual who is performing the cleaning procedure. The bleach might also adversely stain or discolor the tiles of your home. In these cases, there is another solution that you can use- which is baking soda. While baking soda is not as powerful and effective as bleach, it can be used for removing mold from grout lines. You will need to mix one gallon of water with ½ a cup of baking soda. Using this mixture (preferably in a spray bottle), spray this on the affected tile and grout area and leave it on undisturbed for 30 minutes. After 30 minutes, rinse the area with warm water. Now, slightly wet a sponge and dip this into pure baking soda. With the sponge, scrub down the affected area on the tile and grout and rinse out this area once again with warm water. The third method you can use is to mix 1/2 a cup of baking soda with some water and make a fine paste out of it. Now, spread this paste evenly over the grout mold and tile area. Let this solution sit on the tiles and grout for about 10 minutes, after which you will need to scrub the affected area with a bristle brush or an old toothbrush. You can repeat this step once again if you feel the need to. Additional tip: You can substitute the baking soda with Borax and use the same methods above to clean your tiles and grout. Borax is a highly alkaline solution and is ideal for cleaning, removing odor and disinfecting the affected areas. For those who are looking for some of the best natural products to remove mold, vinegar can be a life savior for you! Vinegar is highly acidic by nature and is the best product to use to not only remove but also to prevent the growth of mold on your tiles and your grout lines. Here is how you can remove mold using vinegar – In a spray bottle, mix equal parts of white vinegar with water. Now, spray this mixture on to the affected areas in your home and allow the mixture to sit undisturbed for about 30 minutes. After 30 minutes, you will need to scrub the affected area with a bristle brush and then rinse out the area with water. You should repeat this a couple of times to get the best results out of the distilled white vinegar on the mold. You can also use tea tree oil as a substitute for white vinegar. In a spray bottle, add two teaspoons of tea tree oil with every cup of water. Now, spray this solution on to the moldy areas on your tiles and your grout. Allow this solution to sit undisturbed for a couple of hours and then rinse it out with water. A good tip when using these two methods would be to keep the windows of the room open, as the smell of tea tree oil and vinegar can be quite strong. By keeping your windows open, you will ensure that there is proper circulation of air in the room and you are not affected by the strong smell of the vinegar or tea tree oil. If you have tried all of these methods of mold removal but still are suffering from grout mold, there is one last trick that might come to your rescue. Hydrogen peroxide can work like magic in removing grout mold from your homes. This cleaning agent is a great fungicide and is also a whitening agent which will help effectively clean the area and even remove discoloration. 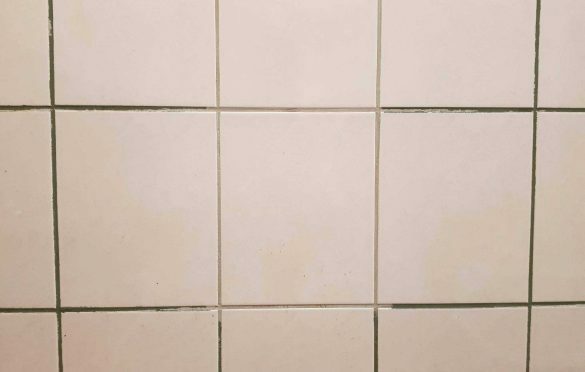 There are two ways in which you can go about this exercise- you can mix hydrogen peroxide with water and spray it on to the affected areas on your tiles or grout. You can also take the hydrogen peroxide directly and apply it over the affected areas to get better results. Mix some quantity of hydrogen peroxide into flour to make a kind of a thick paste. Now, using proper tools and protecting your hands and your face, you should apply this paste on to the tiles and grout where mold is affecting the area. Leave this solution on the tiles and grout overnight to get the best results. The next morning, rinse out the area with cold water. However, in cases where the growth of mold is too extensive, these DIY products might just not work. In those cases, you will need to use a stronger chemical agent to clean out and remove the grout mold. Can be used on wood, vinyl, marble, fiberglass, cloth, shower doors, etc. Here you can check the current price on Amazon. There is no need for scrubbing, brushing or even sanding when using this spray formula. Simply spray the formula on to the affected moldy area and the spray will start working instantly to remove the stains within 15 seconds or less! This big sized 64 oz. 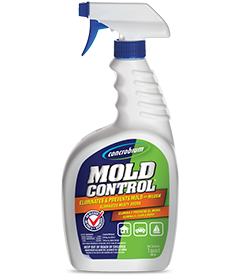 cleaning concentrate can effectively clean and remove mold and mildew stains from an area of up to 1000 square feet. 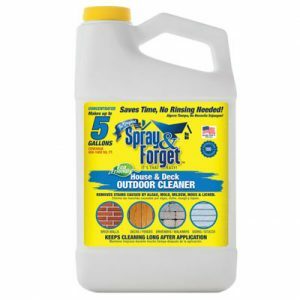 This product is the ideal outdoor cleaning concentrate that you can use on your deck, patio, stone, brick, etc. 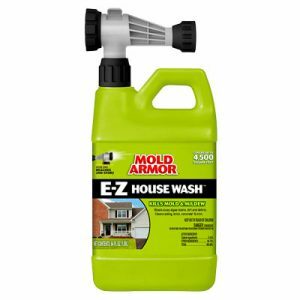 This 64-ounce spray is easy to use as it comes with a spray pump attached to the bottle. The product is concentrated, comes in an easy to use packaging and can effectively remove all kinds of mold and mildew stains from wood and other products. How to actually do it? Removing mold is quite a simple process. However, it should be done very carefully to ensure that you do not harm yourself with the mold spores or the cleaning products. Wear your safety goggles, rubber gloves and mask on your face for your protection. It is important to ensure that you do not accidentally ingest or inhale any of the mold spores as they are very harmful to your health. Properly clean and vacuum the areas in your home where mold is growing. The best kind of vacuum to use would be a HEPA air filter vacuum with an attached long arm which will reach all of those hard to reach places in your home and clean up the mold spores along with any dust and grime. 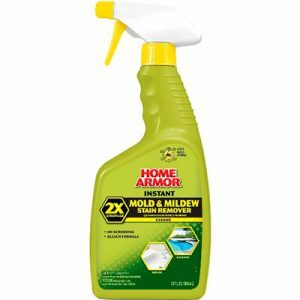 Choose any of the great mold cleaning products mentioned above and apply it to the affected area as per the instructions on the product package. Rinse out properly to remove the entire residual product from the surface you are cleaning. Allow it to dry completely. In cases like this, the old saying “prevention is better than cure” certainly rings true. The methods above tell you some of the best ways in which you can remove grout mold, however, the best case scenario would be to prevent the growth of mold on your grout altogether. The most important thing to remember in this case is that you can prevent mold growth by simply cutting off one important factor which is required for mold growth – moisture. Keep the tiles of your home clean and dry and if you are careful, you will not find mold growth in those areas. Since these areas of your home experience a lot of humidity and water condensation, it is important to ensure that the areas have good air circulation. Keep the windows and doors of these rooms open to allow good air circulation. If you have an exhaust fan in your bathroom, they always run it for a while after taking a shower. This will remove the excess moisture from your bathroom and reduce the risk of the bathroom tiles staying damp and mold growth occurring. Always wipe the shower walls once you are done with your shower, as this will help to keep the tiles and the shower area dry. You can use a sponge or even a washcloth as this will help you reach all the areas in between the tile and the grout and prevent any mold growth. If you are using shower curtains or linen in your bathroom, it is important to buy a material which is easy to clean and maintain. After your daily shower, wipe down the shower curtains and leave them extended as this will help them to dry more efficiently, thus preventing your bathroom tiles from staying damp. After your shower, another important thing you must learn to do is to hang your wet towels to dry outside. By keeping wet towels inside the bathroom, you are simply contributing to moisture and dampness in your bathroom and on your bathroom tiles and grout. You can also seal off the grout in your bathroom using a silicone grout sealer or a water-based sealer. This sealant will basically keep the grout dry and now allow the moisture in your bathroom to easily penetrate into the porous texture of the grout. Most of the grout sealants also come with a good anti-microbial technology which will further provide a barrier to not only moisture but also to other kinds of microbes including grout. Hey, Philip, Thanks for sharing the huge guide on getting rid of mold in the bathroom. Well, I have tried to seal the grout with baking soda before but it never worked for me. I’ll definitely give a try to other options. The home I just bought is a bit on the older side. It is good to know that if I find mold in grout it could mean that there an air circulation problem. I should probably also get a professional to remove the mold as well. All tips are look pretty you keep your basements and other such areas which experience high humidity dry so that mold growth does not occur. Anyway, great post and thanks for sharing such stuff here with us. This is some really good information about mold remediation. It is good to know that it would be smart to have a try using some bleach to get rid of the mold. If I found mold in my home I would want a professional to come and get rid of it all as quickly as possible. You can try power washing to remove mold, dirt, grime or grease in every part of your house.